My friends and family think I’m strange. “Why don’t you buy a house? Buy a car? For God’s sake, don’t you want some . . . stuff?” they ask. The only stuff I want, I tell them, is a box full of photographs and a mind full of memories. This is why I leave so often. I go somewhere, instead of buying things for my sparsely decorated apartment. They think I’m nuts, but they do thrill at the stories I bring back from other parts of the world. Yet they are rarely interested in the stories of trips gone perfectly well. Instead, like most people, they find excitement in the terrible things that have happened to me. Conflict is always more interesting. I’ve been robbed six times, clunked across the head with a bike helmet once, had my camera crushed under the feet of a trampling mob, and had to arrest a fall down a mountain with only inches to spare between the last branch and the cliff edge. They love my story of the robbery on a beach in Lima, as absurd as it sounds: my Peruvian thief was so pleasant, crouched on his knees in front of me, explaining patiently why it was in my best interest “To geev up your ‘Nuevo Sols.’ We don’t ask much, amee-go,” all the while looking over his shoulder at a gang of young men staring in our direction. It was such a pleasant exchange that I think I even thanked him when he walked away, irked only because he had forgotten to write me a receipt. These tales are interesting mainly because I survived to tell them, but as sometimes happens, terrible events have a way of turning into the best arguments for humanity. I witnessed one such event in Ireland in the early 90s. Fresh from college graduation, I set out on a six-month backpacking trip across Europe. Things began well as I tramped through England, Scotland, and Wales. The only source of irritation was the constant rain that seemed to follow me like a homeless mutt. But if I had the pleasure of walking through emerald fields, I had to pay the price for their creation. After a couple of weeks, I took the ferry from Holyhead ,Wales, to Dun Laoghaire, just south of Dublin, Ireland. From there I planned to make my way northwest around the coast and through Northern Ireland, until I reached the Aran Islands on the west side of the Republic. After a few rain- and Guinness-soaked days in the capital city, I started my journey north to Belfast by rail. As sometimes happened in that part of the world at that time, a bomb had been planted on the train. Fortunately for me, it went off in a different car than where I was sitting. Equally as fortunate for the people on that car, the bomb was something of a dud. No one was killed, but the poor woman sitting in the chair closest to where the bomb had been placed lost large portions of her legs from the blast. The train was just arriving at the Drogheda station as the bomb went off. For obvious reasons, we would go no further that day. All passengers were instructed to disembark; the train had to be inspected thoroughly before anyone could be let back on. As news of the abandoned train spread through Drogheda, a medium-sized town less than an hour from Dublin, the townspeople began to make their way to the station. I sat on a bench, unsure what my next move would be. It was then that a stout man, looked to be about fifty years old, with a massive full-moon face and ruddy complexion, approached me. “Where you headed, son?” he asked. “Yes, sir.” In my experiences, such questions often come laced with antagonism, and I know better than to advertise my nationality when I’m abroad. I’ve even taken to sewing little Canadian maple leafs to my pack in particularly dicey parts of the world. But clearly there was no antagonism in this man’s voice; in fact he seemed, upon first glance, to be utterly incapable of bad feelings. “That’s where I live,” I exclaimed, completely abandoning my unwritten travel rule never to admit, not only that was I an American, but that I lived in America’s seat of power. My travels have confirmed for me more than once that some people are unable to separate a simple resident of the capital from one who works there setting policy that many people around the world find offensive. It turned out I didn’t know his daughter, but even without that connection, I became something akin to this man’s son in mere seconds. “Dennis Broderick,” he said, extending a thick and calloused hand. “Come with me, son.” Soon I was loading my pack into the trunk of his car and I was being whisked through the streets of Drogheda. I’ve had Irish friends, familiar with Drogheda, who disparage the town, but to an American who lives on the East Coast, where Irish pubs abound, I found the place entirely charming. Of course, Dennis had lots to do with that charm, but I was not yet completely at ease: hopping into strangers’ cars is simply not something one does in the United States, even if circumstances deem it safe. Dennis and his wife ran a B&B in the middle of town. Before I even had a chance to protest, I was whisked upstairs to a beautiful, clean room, the likes of which I wouldn’t see again until I was home months later. In the few minutes it took me to throw down my pack and marvel at my surroundings, a lovely plate of food had been prepared for me: toast smothered in baked beans, slices of fresh tomatoes, and triangles of hard-boiled egg. I scarfed down the food, each of my many expressions of gratitude waved off as superfluous. I told them all about the museums and the old neighborhoods (at least by American standards), all the while feeling genuinely surprised by how much I truly loved my hometown the more I talked of it. The Brodericks listened attentively. Then Mrs. Broderick asked me if Washington was dangerous. Not thinking about her motives for asking, I told her the truth, which was that, although it was by and large a safe place, there were certain neighborhoods where you did not want to go at certain times. Only two hundred homicides per year was considered a good statistic. With that, Mrs. Broderick excused herself to the kitchen. Dennis immediately got up. “Come on,” he said, and we were back in his car, speeding around little streets until we got to Newgrange, a Neolithic burial tomb not far from Drogheda. Over my protests, Dennis paid my entrance fee. From there, he took me to a few local abbeys that had stood for centuries. When the afternoon was over, we went to a pub near his home, where I tried desperately to keep up with him and his intake of Guinness. It had been an altogether wonderful day, but I began to worry a bit that night as I overheard Dennis on the phone with a potential customer. “We’re full,” I heard him say. “Please do try us again though. We’re only one room, and it’s taken tonight.” This made me nervous. The Brodericks had extended extraordinary hospitality to me, but I couldn’t assume my stay would be for free. In fact, I didn’t want to assume. Although I was on a very tight budget, living on less than twenty dollars a day, I simply couldn’t conceive of giving them nothing. As it turned out, it wasn’t even an issue. The next morning, not only did they flatly refuse to take any payment whatsoever–despite my stay having cost them a night’s lodging–they acted as if my insistence was an insult. But they did ask me for one thing. I made a promise to contact the girl, and after finally convincing Dennis that I absolutely would not allow him to personally drive me to Belfast, I said my goodbyes and jumped the train that had been cleared to once again head north. By trip’s end, I had visited fifteen different countries, many of them filled with glorious sunshine, mountains, and beaches. But of course, the Brodericks had made sure that they all fell short of Ireland: that water-logged, often dismal island buffeted by sea and fog. “Sounds like they gained a son, though,” Bridget said. True enough, that sabotaged train, and all of its potential for horror, was a blessing in disguise for me. Bridget’s parents had gained a son, of sorts, and I made a pair of dear friends, thanks entirely to Irish hospitality. There is a place in Puerto Rico where a panoramic view of Olympus-like mountains, veiled by the shadows of clouds, encircles a town of oft-neglected interest and history. It’s a place where lush greenery grows as far as the eye can see and the golden hands of the sun touch every street corner. This place is called Coamo, just a short drive south of San Juan and northeast of Ponce traveling on route 14. The tranquil valley in which Coamo rests is largely unaffected by the hustle and bustle of the major Puerto Rican tourist centers and appeals to those who prefer “the path less traveled.”Located in the interior of the island, Coamo is a nature lover’s paradise. Driving along meandering country roads will get you so close to the feet of mountains that you can practically stick your hand out of the car window and touch them. Concrete homes painted in pastels of peach, lime, and lavender dot the terraced landscape like rugged steps, each one higher than the next. I was so transfixed by the towering majestic scene before me that a dull cramp settled at the base of my neck from looking up. But I was hypnotized. If you enjoy nature, as I do, consider bringing a neck brace. The tiny sedan in which my companion and I traveled whined like a stubborn pack mule as we coaxed it over the steep hills and dips that snaked before us. Once you’ve had your fill of back-road exploits, you can hit the heart of Coamo. The Plaza de Mercado is the center of activity. An endless stream of traffic pours through the narrow city roads, which are barely wider than one lane on a U.S. highway. Driving in Coamo is not for the timid. If you can drive here you can drive anywhere. The slivers of asphalt are always congested from 8:00 A.M. to 3:00 P.M. when the masses are out and about taking care of their business so they can hurry home and escape the maze of cars and people. Be forewarned that travel in this city is a free for all. Cars seem to only yield at stop signs, bullying their way into the rush of traffic. Blaring horns are a constant in a show of annoyance and defiance, but everyone seems to take it in stride much like riding bumper cars at an amusement park where you are always punching the brakes, hitting the accelerator, and swerving in and out of the path of impending collisions. The shops in the plaza are sandwiched together along the strip. Here you will find furniture stores, gift shops filled with t-shirts, figurines, and Puerto Rican and American paraphernalia, as well as public markets filled with green vegetables and exotic fruits. These stores are somewhat small with little decorative flare but are well stocked, and the prices are relatively cheap (the lack of sales tax is quite encouraging to the wallet). It should be noted that items bearing the name “Puerto Rico” or the image of the island’s favorite animal, the amphibious coqui, are markedly more expensive. Coamo is an amazing place. The third oldest city in Puerto Rico, it is steeped in history and rich tradition. Founded in 1579 by Cristóbal y Blas de Illescas, the town was originally called San Blas de Illescas. 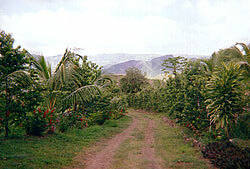 The current name comes from the Taino chief Coamey. At the centerpiece of the Plaza de Mercado is the famous Iglesia de Illescas, a Catholic church initiated by Friar Diego de Salamanca in 1616. It was the first church of its kind to offer religious service to the small community, and today it stands as the cornerstone of the city, with its blinding, pristine façade gleaming in the fierce Puerto Rican sun. The Coamo Museum is just a few yards away from the church. Within its walls are housed interesting facts about the town, the indigenous Taino culture, and of course the Spanish influence with regard to modern Puerto Rican culture. Tradition is very important to the people of Coamo. While many cities in Puerto Rico are striving for a more modern, secular society, Coamo is searching for a time long past. This sense of nostalgia manifests itself in intriguing ways. 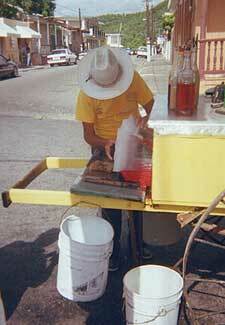 In contrast to Ponce and San Juan, where you have elegant eateries and hotels, in Coamo you will find cozy cafes, open markets, and, if you are lucky, the town’s well-know snow cone maker, called a piraguero, utilizing the old method of making cones shaved from a block of ice, topped with delicious syrup and flavoring. Another example of revival of the “old ways” is the celebration of the town’s religious heritage. 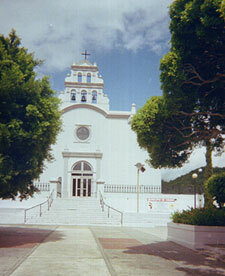 The Catholic Church has been a major influence in Coamo since the city’s founding. Many in the community are seeking to reinvigorate the culture’s religious heritage, and the Rosario de Cruz is one facet of this movement. This spectacle takes place every Friday during the month of May. It alternates from one house to another in worship of Christ and the Virgin Mary. The Rosario is a mark of Spain on the city’s culture. It consists of traditional prayer songs accompanied by modern music, and the spiritual essence of the event is liable to move the most skeptical of hearts. Coameños, as the residents of Coamo are called, come in a variety of shapes and sizes, but one thing they all seem to have in common is a zest for life and an uncontainable energy. They are a humble people, deeply religious and fun loving. 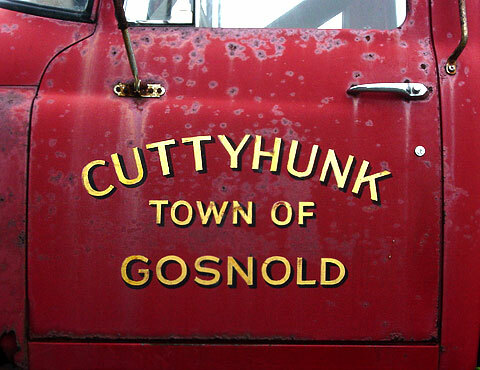 I found them eager to answer questions regarding their home and, when they learned of my intent to write an article about their town, I was given many tidbits of interesting facts. For example, although Bacardi rum is prized on Puerto Rico, you can find a colmado (convenience store) selling the island’s second-favorite beverage, Coors Light, on just about every corner. I drank so much Coors Light during my stay in Coamo that I expect my first born to come out with the word “Coors” stamped on its forehead … but that’s a another story. I found the citizens of Coamo to be quite amicable and hospitable, and they will greet you, not with an informal handshake, but with a warm kiss on the cheek as if they’d known you for years. Don’t be surprised if you find yourself invited to a delicious lunch of ensalada de los pulpos (octopus salad) and fried plantain. By ingratiating myself with one family, I found myself working on their finca, a small farm, cutting espigas off of recao plants (an herb similar to cilantro; my back may never be the same). Nevertheless, the people are quite inviting. Impress them with your Spanish and make a friend for life. After all that sightseeing and mingling with the locals, it was time for a little R&R. Coamo has that covered too. For golf fanatics, one must visit the beautifully kept Coamo Springs Golf Club and Resort. The eighteen-hole course is the only one of its kind in southern Puerto Rico. The weather is nearly always perfect and the fairways are from heaven. If golf is not your style, you can take a jaunt to the famous Baños de Coamo. Used by the natives of Coamo for its mythical therapeutic powers, the baths of Coamo are thought to be the “Fountain of Youth” for which Conquistador Juan Ponce de Leon searched so frantically. There are two entrances to the springs. One is for the public and is free; however, it not well maintained and is often crowded by the locals who use it as a meeting place to discuss civic events and politics. The other entrance is through the parador Los Baños de Coamo. The forty-eight-room hotel was once one of Puerto Rico’s most upscale resorts. Current rates range from US$62-$81 per night. The rooms are not luxurious by any stretch of the imagination, but the accommodations are fair considering the price. If you do not wish to stay at the hotel you can still take advantage of their baths for nominal fee. So the next time you are looking for a vacation outside the norm that offers good people, adventure, history, and fun consider the path less taken and descend to the valley of paradise. Bienvenidos a Coamo.